On Friday May 22, 2015, PAC-MAN™ – one of the most iconic videogame characters in history – will celebrate his 35th birthday. With the character coming to the big screen this summer in Sony Pictures’ Pixels, the studio is joining in to celebrate with a global birthday party of epic proportions. 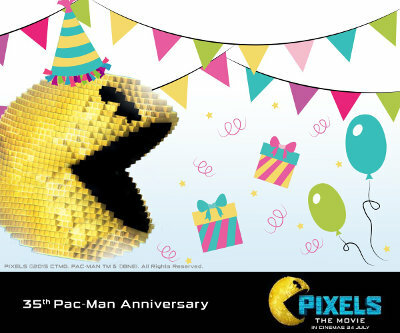 In cities around the world and online, film talent will join with moviegoers and special guests to celebrate with birthday cakes, free play of the PAC-MAN arcade game, and special events localized to each city. Pixels is set for release in theaters nationwide in South Africa and the US on July 24, 2015. As kids in the 1980s, Sam Brenner (Adam Sandler), Will Cooper (Kevin James), Ludlow Lamonsoff (Josh Gad), and Eddie “The Fire Blaster” Plant (Peter Dinklage) saved the world thousands of times – at 25 cents a game in the video arcades. Now, they’re going to have to do it for real. In Pixels, when intergalactic aliens discover video feeds of classic arcade games and misinterpret them as a declaration of war, they attack the Earth, using the video games as the models for their assaults – and now-U.S. President Cooper must call on his old-school arcade friends to save the world from being destroyed by PAC-MAN, Donkey Kong, Galaga, Centipede, and Space Invaders. Joining them is Lt. Col. Violet Van Patten (Michelle Monaghan), a specialist supplying the arcaders with unique weapons to fight the aliens. In Tokyo – the city of PAC-MAN’s birth – audiences will join in the fun by attempting to break the GUINNESS WORLD RECORDS™ title for the Largest Human Image of PAC-MAN on May 21, 2015. At the event at Tokyo Tower, actor Shingo Yanagisawa and popular comedian and social media sensation Naomi Watanabe will join hundreds of moviegoers to create the largest PAC-MAN ever created by human beings. In Chicago, Professor Toru Iwatani, the creator of PAC-MAN, and BANDAI NAMCO ENTERTAINMENT INC. will be at Level 257™, a brand new dining and entertainment facility created by NAMCO USA INC. inspired by PAC-MAN. A special 1980s-style event on Friday evening from 7pm-midnight will include gaming industry VIPs, free game play including a chance to play the fabled 255th and 256th levels of PAC-MAN, PAC-MAN’s official 35th birthday cake, live performances of the 1982 hit song “PAC-MAN Fever” by the original artist, Jerry Buckner of Buckner & Garcia and a personal appearance by PAC-MAN himself! The celebration continues the next day with celebrity discussion panels, photo opportunities, prizes and game play contests including opportunities to play against the legendary gamer Billy Mitchell, the first person to ever achieve a “perfect score” on PAC-MAN. And in Spain, four of that country’s biggest YouTube stars will face off on the game for the ultimate bragging rights. As they engage their followers to look on, both online and in person, there could be as many as 21 million watching the videogame competition. Pixels is directed by Chris Columbus. The screenplay is by Tim Herlihy and Timothy Dowling with a screen story by Tim Herlihy, based on the short film by Patrick Jean. The film is produced by Adam Sandler, Chris Columbus, Mark Radcliffe, and Allen Covert.